Microsoft Dynamics NAV is an Integrated ERP solution designed for small & medium-sized enterprises. Automate your business processes with its well-rounded ERP system. Gain complete control and get deeper insights into your finances. Customize different working environments for various departments to meet their specific needs. Get your company equipped with the functionality to easily manage accounting, assets, inventory, cash flow and all other financial processes. With a centralized data repository, business data will always be up to date and accessible via the same portal; no more disjointed data & spreadsheets. Easily manage your contacts, sales opportunities, and service contract so you can focus on delivering good customer service. Organize service resources to improve efficiency and increase profitabiity. Manage customer relationships effectively by having their best interests at heart. Track and manage all manufacturing processes from production to orders, inventory and vendors. Improve manufacturing operations with tools that help your company adjust to customers demands and have the capacity to resolve complex situations. Customize and monitor all supply chain activities from inventory levels, shipment schedules to goods delivery. Gain insights to help sharpen production planning, improve shipment schedules, cut inventory costs and much more. Track projects and record purchases of inventory and services. Create estimates and plan capacities to ensure cost and utilization of resources are in line with the financial blueprint. Keep track of usage on jobs and data for invoicing the customer. Organize information about your employees and have a complete overview of your company’s operations. Have control over human resources data from managing employee records, tracking absentees to preparing reports. 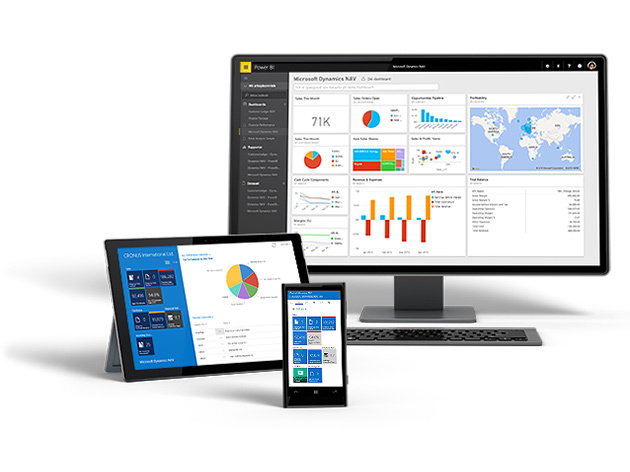 Integrate with Power BI to gain insights into your business. Get real-time visibility and analytics to track performance and produce highly sophisticated reports that will help you better understand your organisation. With all the data at hand, your company can plan the best for what’s ahead.